Is Diversification the Right Strategy for your Cryptocurrency Portfolio? When getting started in investment, diversification is one of the most common approaches advised to manage your portfolio. Diversification is essentially the process of determining percentages to allocate to different assets and rebalancing regularly to manage the risk. Many view it as the holy grail of investing. Others see it as simply selling winners to buy losers. Then there are other less known approaches which can be applied. This guide delves into what diversification really is to help you determine whether it is the right strategy for your portfolio. We also present some of the most interesting alternatives which may be a much better fit for your portfolio and investing goals. Diversification is a strategy grounded in Modern Portfolio Theory. Modern Portfolio Theory was developed in 1952 by Harry Markowitz. The idea underlying it was that by diversifying the assets in a portfolio, the return could be maximised for a given level of a risk. Markowitz found that by adding uncorrelated assets to a portfolio, the standard deviation of returns which is commonly used as a measure of risk decreased while the expected return was less impacted. Correlation is simply a measure of the tendency of assets to move together. If one asset increases by 10%, one which is perfectly correlated would also increase by 10%. The measure of risk used for the theory is Standard Deviation. Standard deviation is essentially a measure of how much returns will vary. A higher standard deviation will give rise to a wider dispersion of returns. Portfolio designed according to modern portfolio theory aim to maximise the expected return for a given level of standard deviation. 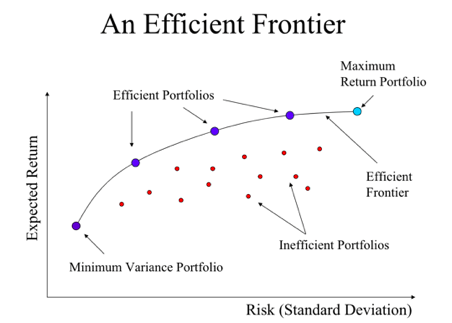 As per the below graphic, the efficient frontier is drawn which is the maximum return which can be achieved for a given level of risk in the portfolio. Higher risk results in higher reward but the key point to note is that portfolios which fall under the efficient frontier are inefficient as a higher level of expected return could be achieved for the level of risk if the right collection of uncorrelated assets are constructed. Now you know the theory. What you really want to know is how it looks in practice. There are many ways to slice and dice it. Typically, investors will decide on what percentage to allocate to different asset classes which have different risk levels. Cryptocurrencies are considered a high-risk asset class and for a good reason. The technology has only been in existence for ten years and the industry and ecosystem are still in the early levels of development. This results in many of the characteristics of a high-risk asset class including high amounts of volatility, illiquidity, and an unregulated market. Investors decide what percentages to allocate to different asset classes based on numerous factors which include their age, the investment time horizon, and their net worth. If investors are young and have a longer investment time horizon, the allocation to higher risk assets will be larger. If investors are older and have a low investment time horizon, they will focus on allocating larger amounts to more liquid and lower risk assets. Lower risk assets are also associated with higher net worth levels as capital protection becomes more important. Another important factor taken into consideration is the investor’s tolerance for risk. This can be assessed in a number of ways and there are tests which attempt to measure it. The end result will look something like the chart below where 15% is decided to be allocated to cryptocurrencies. This would actually be a very large percentage for most investors to allocate to a high-risk asset with most investors allocating around 5% to high-risk assets. 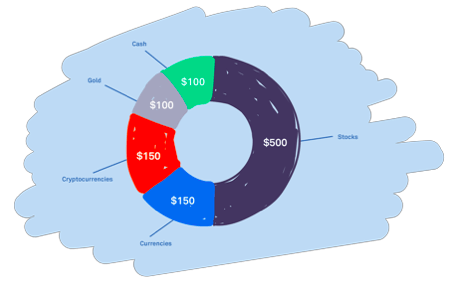 Those reading this guide are likely willing to allocate even higher amounts than 15% to the cryptocurrency asset class. A rebalancing period is then chosen. Rebalancing returns the portfolio to the percentage allocations determined. It typically takes place around once per month. Too regular of a rebalancing period would result in investors paying large fees. Too irregular of a rebalancing period would result in the portfolio potentially deviating far from the chosen allocations. Let’s say in one month, cryptocurrencies in the portfolio appreciate by 100% and stocks depreciate by 30% while all other assets remain the same. This leaves us with a new portfolio where 35% is allocated to stocks, 30% to cryptocurrencies, 15% to currencies, 10% to gold and 10% to cash. The rebalancing would involve investors selling half of their cryptocurrency holdings and using this to buy stocks to return the percentages to their original allocations. Cryptocurrency portfolios are often diversified within themselves with high amounts typically being allocated to Bitcoin given that it is the lowest risk of cryptocurrencies. 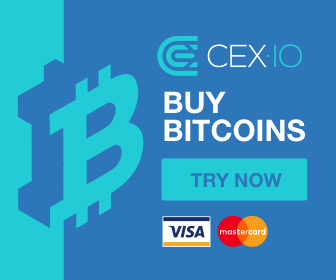 Lower amounts can then be allocated to earlier and higher risk projects such as lower capitalization altcoins and ICOs. The key benefit of diversification is the fact that it is a straightforward framework which helps investors manage their risk. The key principles underpinning the theory go against exposing all of the capital to one asset class or investment. There is also the potential that investors using this approach will accumulate a lot of a valuable asset while it is cheap. Picture a scenario where an asset class in the portfolio continues to depreciate for a prolonged period of time, while another asset class is appreciating as can be the case with putting uncorrelated assets together. This would enable the investor to accumulate significant holdings in the depreciating asset class as they sell the appreciating asset to increase their holdings in the depreciating one. If the asset being accumulated ends up being highly valuable in the future, this would be a case of diversification and rebalancing operating at its best. Diversification may not be the holy grail which many claim it to be. The approach has many flaws, especially as it relates to cryptocurrencies. First and foremost, an investor’s risk tolerance is difficult to assess. While there are measures such as questionnaires, the value that these measures provide is questionable. Investors can often overestimate the amount of risk that they can handle. If an investor allocates 90% of their portfolio to cryptocurrencies, will this investor be able to effectively manage the portfolio and follow their strategy if the cryptocurrency portion of their portfolio proceeds to depreciate 90% or more? The effectiveness of diversifying within the cryptocurrency segment of the portfolio is also highly questionable. Cryptocurrencies are highly correlated. This means that investors may just be adding trading fees to their portfolio. The nonlinear nature of emerging technology markets such as cryptocurrencies is another factor which works against the diversification approach. These markets typically develop in a way in which the majority of gains go to a small number of assets. When diversification is applied to this nature of the market, it results in investors selling the assets which will turn out to provide enormous gains to buy assets which will either fail or provide minimal returns. It could be the equivalent of selling shares in Amazon to buy shares in Pets.com. One approach for handling the effect where a few cryptocurrencies are likely to have a disproportionate amount of the returns is to determine what is the minimum allocation going to be for each asset. This could be determined that regardless of how the portfolio develops, there will be a minimum exposure to at least 10 Bitcoin, 100 Ethereum, and 500 Litecoin. The idea is that these holdings are never sold until far down the line. It is similar to a venture capitalist acquiring a stake in a start-up and not selling their position until the start-up reaches the IPO stage, is acquired by a larger company, or fails. Translating this to cryptocurrency terms would mean maintaining the target allocation until cryptocurrencies are no longer considered an emerging tech and the cryptocurrencies you have chosen reign supreme, or don’t. The amount of exposure to the cryptocurrency can change over time but the key principle is that it does not reduce below the target allocation. The Kelly Criterion, which is named after John Kelly is a strategy for determining what percentage of capital to stake on a certain idea or to a certain investment. It is popular among professional gamblers and sports bettors as well as among some in the money management business. Warren Buffet has noted it as a tactic which he uses. The strategy has been noted to be a very effective strategy for both capital accumulation and the management of risk. The Kelly Percentage is used for how much capital to the investment area. If the Kelly Percentage was 10% for the area of cryptocurrency investments, then 10% could be allocated to cryptocurrencies. If stock investments returned a Kelly percentage of 25%, 25% could be allocated to this investment area and so forth. The equation can sometimes return large percentages so the half Kelly is often used whereby the capital allocated is only half of what the Kelly Percentage returns. It also assumes that the investor has a large trading history in different asset classes so it is often not the ideal strategy to apply for non-professionals. There is also evidence that all the complicated mumbo-jumbo portfolio construction is overkill. Basic strategies actually perform very effectively as well. The naive approach is a straightforward strategy which has been shown to perform well. The strategy involves splitting your portfolio into 1/N segments where capital is split evenly into different asset classes. A ¼ naive portfolio would involve putting 25% of capital into four different asset classes which could be stocks, bonds, precious metals, and cryptocurrencies, or other asset classes instead. Harry Markowitz who developed the above modern portfolio theory even applied this strategy by splitting his money equally between equities and bonds. Another straightforward strategy which is recommended by investment greats such as Warren Buffet is dollar-cost averaging. If regularly allocating capital to investing and expanding the portfolio, dollar cost averaging is an effective strategy to use. This is where investors gradually expose themselves to a market over time instead of putting all of their capital in at once. 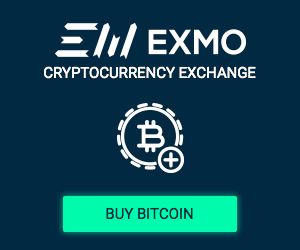 Let’s say an investor has €5,000 that they are willing to invest into cryptocurrencies. An example of dollar-cost averaging would be putting €500 in every month instead of putting it all in the market at once. This helps manage risk and prevents the possibility of putting all your capital when prices are at their absolute high. This also works well if investors are taking a part of their regular income to put towards investing. For example, someone who earns a salary of €2,000 per month may decide to put €400 of this towards investments every month. Dollar-cost averaging is more of a strategy of how to build the portfolio as opposed to the optimal construction of it. There is no perfect portfolio theory. If there was, everybody would be using it and it would likely lose its advantage. There are many approaches which can be used and each has their upsides and downsides. There are a lot of reasons why diversification may not be the best strategy for cryptocurrencies. Among these, is the emerging technology classification of the cryptocurrency asset class, and the high correlation between cryptocurrencies. If another approach is adopted, it is important that the investor clearly outlines how they are going to follow it and is comfortable sticking to their strategy.